An extensive laboratory campaign was conducted to better understand the structural behavior of the designed solutions. Under main focus was the performance of the connectors between the inner and outer RPC panels. 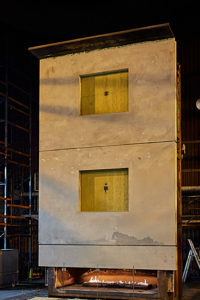 First, pull-out tests were applied as screening method to determine possible connector options, optimal geometry and required concrete cover. The load capacity of the element anchors was also determined as these are used both for lifting and for attaching the element to the building. 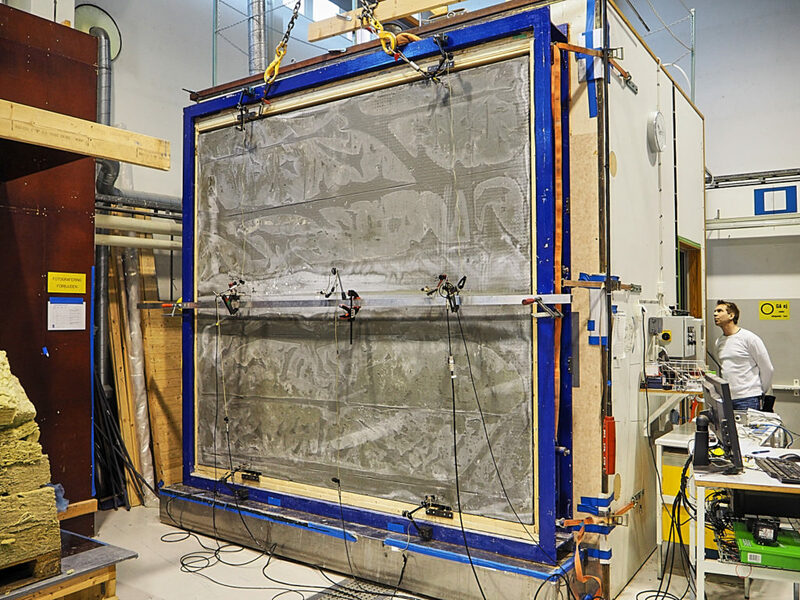 Then, shear tests were used to characterize the shear behavior for different connector configurations and select connector systems for further development and testing. Large scale sandwich elements were subjected to 4-point bending to verify the connector performance and composite action and give input for the calibration of the numerical model. Finally, wind load test on a full sandwich element was investigated in a chamber where both pressure and suction forces were applied simulating the cyclic effect of wind loading. Testing the load capacity of GFRP connectors (left) and element anchors (right) by means of pull-out. Testing the sandwich elements in shear (left) and in bending (right). Element size: 1100 x 700 x 235 mm3 (left) and 2500 x 600 x 200 mm3 (right). Rig for cyclic wind load test (element size: 3000 x 2800 x 200 mm3). One of the objectives of SESBE is to develop fire safe façade systems. This pertains to both the building occupants as well as rescue units. In case of fire, it is important to minimize flame propagation to the upper stories of a building and falling down of parts from the wall. 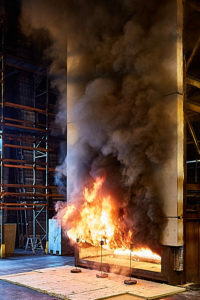 In this task, the fire resistance of the developed sandwich elements was tested in a full-scale, in accordance with the standard method for the Nordic countries, the SP Fire 105 method. The wall system covering an area of 6 x 4 m2 consisted of three elements joint with a fixing system and horizontal joints fitted with expandable sealing tape. 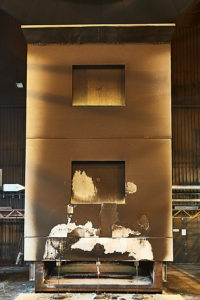 Large scale fire test (total size: 6000 x 4000 x 200 mm3). It is well recognized that indoor emissions from materials are cause of a number of health symptoms. Therefore, for the successful implementation of new materials in construction it is important to guarantee low levels of emissions. Volatile organic compounds, formaldehyde and ammonia were tested according to ISO 16000-9:2006. Very satisfactory results were obtained. The emission rate of TVOC was less than 10 μg/m2·h, formaldehyde was less than 2 μg/m2·h and ammonia less than 5 μg/m2·h. There were no carcinogenic substances detected in the emission. The purpose of an adequate building envelope is, among others, protection against noise. In SESBE, the sound insulation of sandwich façade elements was be determined. Results showed that the noise reduction values is similar or slightly better compared to stand materials and sandwich designs.